Here comes another round of MIUI Weekly App Trend! Last week we shared Skill Improvement Apps, and this week we are going with Science Related Apps. Enjoy! Science is everywhere and is a part of everything. However, most people don’t know all that much about science. We have the basics, like how water evaporates when heated or (in general) how the sun works. There is a whole lot more than that, though. There is always an opportunity to learn more about the world around us, even the stuff that we can’t see. Here we present you the 10 Best Science Apps we collected this week. Weekly App Trend #50: "Science Apps"
(1) SkEye | Astronomy - Advanced Planitorium In Your Mobile! (3) Science Facts - Read Some Of The Most Amazing Facts. Want to be the life of the party? Impress some of your friends? Or simply read some of the most amazing facts to pass time? Then, "Science Facts" is THE app that you really need! For instance, did you know that scientists have developed a way of charging mobile phones using urine? Did you also knew that bees can be trained to detect bombs? What's even more cool? You don't even need Internet to read them. Enjoy them anywhere and anytime you want. Science Reporter is a monthly popular science magazine that has been published in India since 1964 by the National Institute of Science Communication and Information Resources, a government agency based in New Delhi. You can download this app to read this magazine in offline mode in your mobile. The magazine was originally intended to make citizens aware of the research taking place in various scientific institutions in the country. It has now outgrown this initial agenda, becoming a popular science magazine that covers many national and international science issues. There are reports of current interest, as well as essays written by eminent national scientists on modern technologies, the country's science policy, and the like. Regular columns on science fiction, puzzles, hobby projects, crosswords are also present. This app provides Science Reporter in digital format. • Get access to all Physics, Chemistry and Mathematics formulas at one place. • Browse Formulas without any internet connection once you have logged in to the app. • No more spending hours on writing important formulas on a paper, just use Formula Deck Cheat Sheets. • Mark formulas which you find hard and revise them all together in the Marked to Memorize list. • Helpful for Students preparing for Class 12 Boards (CBSE, ISC, etc. ), IIT JEE and Other Engineering Entrance Exams. • Explore the most comprehensive collection of Sir David’s work ever released online. • Includes six decades of highlights from more than 40 landmark BBC programmes, including Planet Earth, Blue Planet, The Life of Mammals, Africa and others. • Watch unique collections of films curated by Sir David and others. • Create and save your own collections and share them with friends and family. • Hunt for hidden films featuring Sir David, recorded exclusively for the app. • Explore extraordinary sequences of animals and plants, from iconic large species to rarely seen enigmatic creatures. See them hunt, mate, eat, travel and communicate in their natural habitats; ranging from the high mountains to the deepest oceans, across deserts, forests and the polar ice caps. • Watch lions, polar bears, whales, sharks, eagles and giant lizards and many more. • Use wi-fi for the optimum experience. The dictionary currently contains 17000+ words and terms. 17000+ is not at all enough for a subject such as Science. Many words might be missing from the dictionary. If you find any corrections or missing words, then please feel free to contact me at the email id mentioned on the bottom of the page. Be an expert on the Science world! New discoveries, research, interesting interviews and studies. All you wish to know about the current science world brought to you in an easy to use, simple and efficient app! - A news summary covering stories from all sources! Clean feed with no repeated stories. For each story - see all sources that covered it with a simple tap! - Subscribe for push notifications for prominent stories (optional)! - New discoveries, interviews, research results, studies and interesting talks - brought to you from the leading Youtube channels! - A community of science lovers! An in-app commenting system, article tagging, reputation points and badges! - Free built in read later - save interesting articles for later reading! 1. SkEye | Astronomy - Advanced Planitorium In Your Mobile! 3. Science Facts - Read Some Of The Most Amazing Facts. 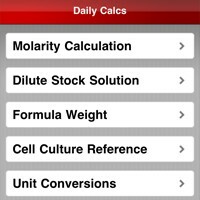 DailyCalcs :- Science Conversion Calculator.